WITH WIDOS WELDING MACHINES FOR PLASTIC PIPES. The highest quality of our WIDOS welding machines has top priority and is very much anchored in our thoughts and actions. In combination with our demand to not only satisfy you as our customer but to directly target your individual wishes trying to give the best each and every day, it is the incentive for our staff to give the very best in performance and quality. From the start, we are supplying constant quality. Thus, our systematic and verified proceeding lowers your costs at the same time and increases your profitability - because you can rely on us and the quality of our welding machines. ​All WIDOS staff members on all levels take our pursuit of quality for granted. Reliability, high quality and the connected longevity of our plastic welding machines guarantee – thanks to our constantly high demand of quality towards ourselves and our products – high investment security. Innovative technologies showing great effect in your production: optimal profitability, secure investment and highest product performance for our constant product quality. Our high-performance product range of plastic welding machines with welding equipment, saws and accessories fulfill the highest demands in quality. Thus, WIDOS offers constantly high quality welding machines, welding equipment, saws and accessories. WIDOS products are labeled with the CE symbol and tested according to DVS 2208 part 1, EN 292 and ISO 9001:2008. Our focus on very good welding qualities in the pipe fusion technology, our reliability and the optimal equipment profitability raise your performance onto premium level. There is even more - as part of our spare parts warranty we can still offer service and spare parts for machines of the first generation. 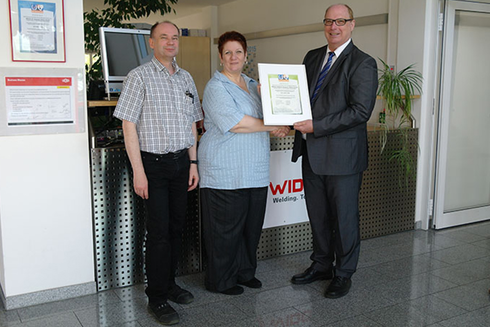 WIDOS fulfills the requirements according to ISO 14001 and thus combines the highest quality with more ecology. The quality of our original WIDOS plastic welding machines is constantly improved in order to offer the best possible service to our customers.